This year, Cutter Morning Star School District has received approval from the State to use Alternative Methods of Instruction (AMI) on days when we have inclement weather or exceptional circumstances and must cancel school. We will take advantage of using this new way of teaching and learning on any days (up to 5) that would otherwise have been ‘snow days’ to be made up at the end of the year. 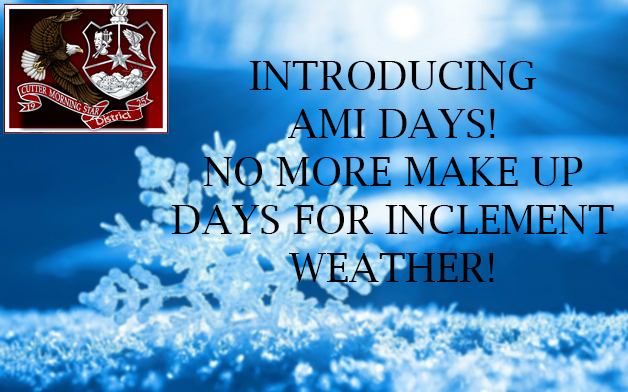 AMI Days will be used the first time we have inclement weather this school year. Please ask your child’s principal if you have questions about this new practice. Thank you for your support of Cutter Morning Star School District. Please click here for information regarding AMI days.